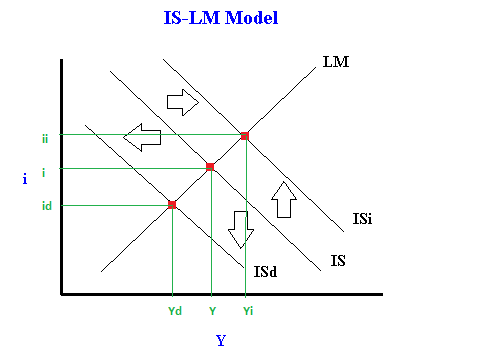 Mathematically solving for equilibrium Y and I after a shift in the IS/LM model - FreeEconHelp.com, Learning Economics... Solved! 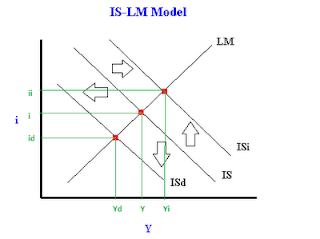 We are going to solve the IS and LM equations in terms of Y (and i) and then solve for the equilibrium price, consumption and investment level as well. After this we will change an exogenous variable simulating expansionary fiscal policy and go through the implications. Now solve for I to get the slope of the IS curve (economics has a weird way of plotting dependent vs independent variables!). Note that P doesn’t enter the IS equation, so this equation holds for any given P (price level). P enters in the LM equation, and changes in P will shift the LM curve which will intersect the IS curve at different locations thus our IS curve holds for any given P.
Note that P (price level) enters in the intercept term, which is why the LM curve shifts when P changes. Now we can simulate expansionary fiscal policy by increasing G by 11.2. Note that a change in G (an exogenous variable) will shift the IS curve to the right. The IS curve shifts right because an increase in G is a form of expansionary fiscal policy. We now have to calculate all of the new equilibrium values. This method works because we are just changing the equation for an exogenous variable that doesn't depend on either Y or i. And we can set this equation equal to our LM equation from before (and we can do this because P has not changed and the LM curve has not shifted). Which will be our new equilibrium interest rate (note that it is higher, which is what we would expect because of the need to borrow more money and the crowding out effect). 220.71 which is higher than our previous Y which is what we would expect. Finally, we can repeat the steps above for calculating the new levels of investment, and consumption. We have just mathematically gone through a shift in the IS curve, let me know if you have questions or comments below. I think the main part of solving this was making the connection between an increase in G and the IS curve while the LM curve remained the same and therefore the price level is the same.